eCite - Primary metal enrichment at the black-shale hosted Talvivaara Ni-Zn-Cu-Co-U deposit, Finland: links to Paleoproterozic seawater? Primary metal enrichment at the black-shale hosted Talvivaara Ni-Zn-Cu-Co-U deposit, Finland: links to Paleoproterozic seawater? 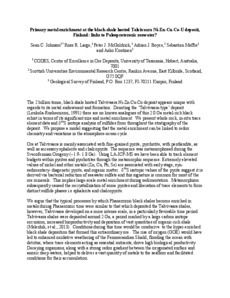 The 2 billion tonne, black shale hosted Talvivaara Ni-Zn-Cu-Co deposit appears unique with regards to its metal endowment and formation. Denoting the ‘Talvivaara-type’ deposit (Loukola-Ruskeeniemi, 1991) there are no known analogues of this 2.0 Ga metal-rich black schist in terms of its significant size and metal enrichment. We present whole rock, in-situ trace element data and δ34S isotope analysis of sulfides from throughout the stratigraphy of the deposit. We propose a model suggesting that the metal enrichment can be linked to redox chemistry and variations in the atmosphere-ocean cycle. Ore at Talvivaara is mainly associated with fine-grained pyrite, pyrrhotite, with pentlandite, as well as accessory sphalerite and chalcopyrite. The sequence was metamorphosed during the Svecofennian Orogeny (~1.9- 1.8 Ga). Using LA-ICP-MS we have been able to track element budgets within pyrites and pyrrhotites through the metamorphic sequence. Extremely elevated values of nickel and other metals (Zn, Cu, Pb, Se) are associated with early stage, synsedimentary- diagenetic pyrite, and organic matter. δ34S isotopic values of the pyrite suggest it is derived via bacterial reduction of seawater sulfate and this signature is common for most of the ore minerals. This implies large-scale metal enrichment during sedimentation. Metamorphism subsequently caused the recrystallization of some pyrites and liberation of trace elements to form distinct sulfide phases i.e sphalerite and chalcopyrite. We argue that the typical processes by which Phanerozoic black shales become enriched in metals during Phanerozoic time were similar to that which deposited the Talvivaara shales, however, Talvivaara developed on a more intense scale, in a particularly favorable time period. Talvivaara shales were deposited around 2 Ga, a period marked by a large carbon isotope excursion, increased bioproductivity and deposition of vast quantities of organic-rich shale (Melezhik, et al., 2013). Conditions during this time would be conducive to the hyper-enriched black shale deposition that formed this extraordinary ore. The rise of oxygen (GOE) would have led to enhanced oxidative weathering of the Fennoscandian Shield, flooding the ocean with detritus, where trace elements acting as essential nutrients, drove high biological productivity. Decaying organisms, along with a strong redox gradient between the oxygenated surface and anoxic deep waters, helped to deliver a vast quantity of metals to the seafloor and facilitated conditions for their accumulation.